The two most commonly used attitude reference sources are the Earth and the Sun. For the purpose of attitude determination, the Sun is normally taken as a point source of light or as a uniformly illuminated disk. 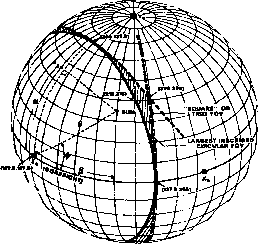 In contrast, the Earth as seen from nearby space has a relatively complex appearance, at least some aspects of which must be modeled for accurate attitude determination. The surface of the Earth is in thermodynamic equilibrium with its surroundings in that the total energy received from the Sun approximately equals the total energy which the Earth radiates into space. * If this were not the case, the Earth would either heat up or cool down until the radiated energy balanced the energy input. Table 4-1 shows the global average radiation for the Earth from meteorological satellite measurements.